Our 2018 concert was held on Saturday 17 November 2018 in the SEC Armadillo, Glasgow. Over 100 choir members were accompanied by a live orchestra presented an evening of nostalgia with songs from the 60s, 70s and 80s, including songs from musicals Chicago, Les Misérables and West Side Story. 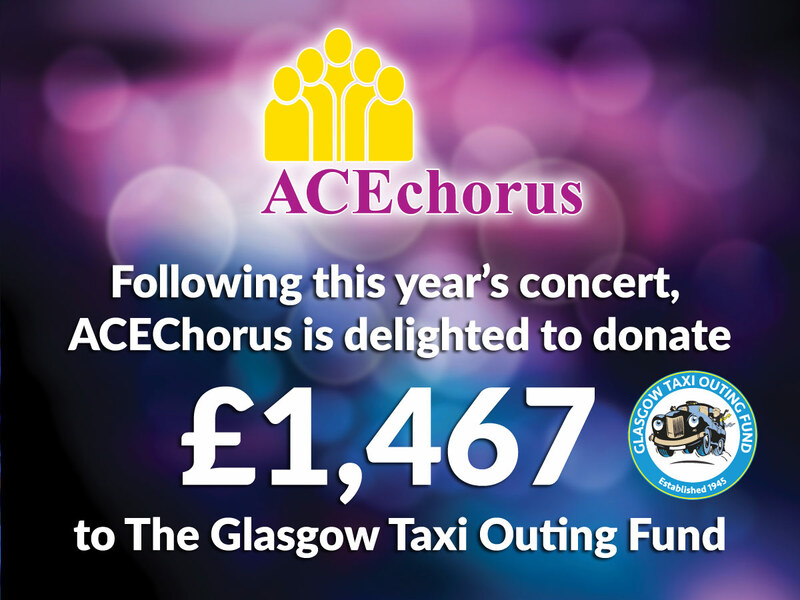 Following the concert, ACEChorus is delighted to donate £1,467 to this	year's	chosen	charity, the Glasgow Taxi Outing Fund. ACEChorus is delighted to donate £1,312 to Playlist for Life following our 2017 Concert. Songs performed on the night included Luck Be a Lady from Guys and Dolls, Endless Love by Lionel Ritchie, Goldfinger, an ABBA Medley, Tonight from West Side Story, Master of the House from Les Misérables, Superstar from Jesus Christ Superstar and many more. On Sunday 4 June, members from ACEchorus gave a free public performance of a number of songs at Kelvingrove Art Gallery in Glasgow. If you missed us, or you'd like to see more we will be performing in the Gallery again on Sunday 25 June. It took ACEchorus all of two seconds to accept an invitation to appear in Barry Manilow's farewell concert at the Glasgow Hydro on Tuesday 14 June 2016. How could we refuse? Three songs and three rehearsals later we gathered at the main entrance to the venue to be met by Frank Duggan, their Liaison and Hospitality Exec. A rehearsal studio was set aside for us and we quickly made ourselves at home. To calm our mounting excitement we launched into our warm-up with the three finale numbers. No time to get nervous as we were then escorted to the main arena for positioning and a work-out for each song, with Kye. Back to the studio to practise what we should be doing over and over again till we finally got it right. Frank came to give us all our vivid red performing robes and a few minutes later we were back stage, and the biggest thrill of our lives was about to begin. The Finale music filled the Auditorium and we were ON! What a noise! What an atmosphere! What a thrill! "It's a Miracle, such a Spectacle, Oo Oo, baby it's you. Whoo!" ACEchorus had lived the dream. You can view a clip from the concert on Youtube. There are still opportunities to join ACEchorus, especially men and altos, for our big concert in the Armadillo in November. Contact us for more information. ACE is a is a non profit-making company and supports a nominated charity each year. Founded in 1999, Artistic Concert Experiences (ACE) is a singing group based in Scotland. The company, directed by Richard Johnston and Rona McKenzie, stages annual live concerts in the Clyde Auditorium, Glasgow. The large chorus, made up from a friendly group of 150 enthusiastic singers, is joined by a large professional orchestra and together ACE perform an annual concert featuring a variety of songs from well known stage musicals to middle-of-the-road, old familiar classics and the occasional surprise. and Dramatic Association (NODA) .